Francis Greenburger - Time Equities Inc.
"We believe that to succeed in real estate one needs to have a long-term view, be flexible, opportunistic and able to maintain a balanced portfolio in diverse markets." 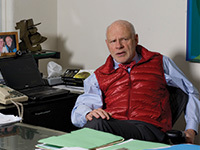 As the Founder and guiding force behind Time Equities, Inc., Francis Greenburger has earned a reputation for outstanding integrity and an uncanny ability to foresee changing directions and create value in a variety of real estate markets. Francis lives with his wife, Isabelle and is a devoted father to his four children. He is an active board member in and supporter of, various arts, education and community organizations, as well as the owner of Sanford J. Greenburger Associates, Inc., a full-service literary agency based in Manhattan. He spends his free moments in search of the perfect backhand or skiing (carefully) down the slopes.